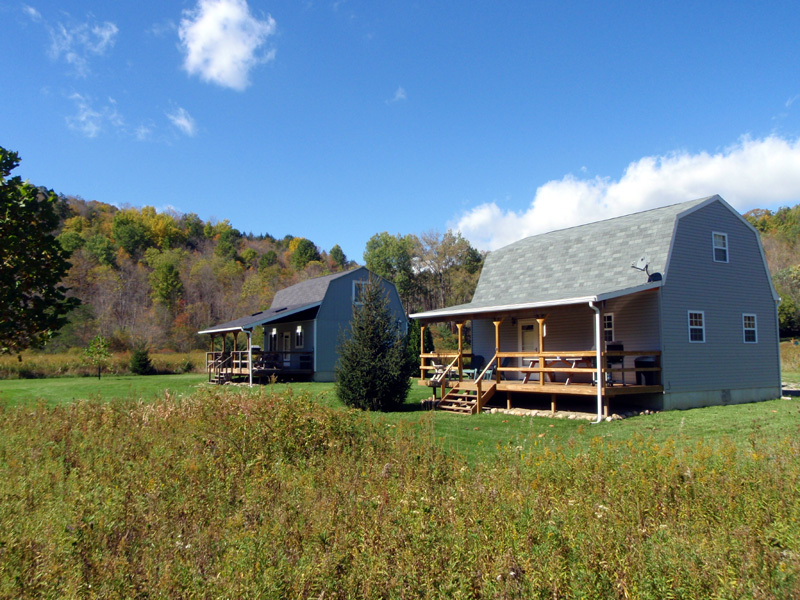 Stay at one of our fully equipped cabins on Cattaraugus creek in Zoar Valley. The cabins sit on 60 quiet & secluded acres with over 4500' of private streamside frontage on Cattaraugus creek. There are no steep or long hikes to get to the stream, and you can even park your vehicle on our private property just steps away from the Catt! Each cabin has a covered deck out back to grill & eat your dinner, watch the soaring bald eagles & enjoy a cocktail. Great steelhead fishing is just a short walk from the cabins. Great hiking and canoeing/rafting is also available in scenic Zoar Valley. A great alternative to Allegany State Park. Both the "Rainbow Trout" & "Brown Trout" cabins are fully equipped. They have a full kitchen, living area, and full bathroom on the 1st floor. The full bathroom has clean towels and washcloths. There’s a fridge, range/oven, microwave, toaster & coffee maker. Glasses & coffee mugs, as well as all cooking pots/pans, plates and utensils, are supplied. There are couches and a coffee table in the living area, along with direct satellite television, WiFi, a dvd/vcr and a small selection of videos. The covered back deck is equipped with a picnic table & charcoal grill. The second floor is divided into two bedrooms, with four single beds in one bedroom, and a full size bed in the other room. The bedrooms are prepared with fresh sheets, blankets and pillows. The cabins are fully insulated and heated. There’s a fire pit out back for night time bonfires. Our cabins are open all winter and available for diehard winter anglers, or for those who just want to get away from the crowds for a weekend. Ellicottville and Holiday Valley Ski Resort, with great skiing and other outdoor winter activities, are 25 minutes away. Miles of snowmobile trails are accessible from our property. The village of Springville is four miles east, while the village of Gowanda is ten miles west. Fall/Spring rentals are for Fly Fishing, Catch & Release only. Summertime rentals allow any angling method. Check-in time is 3pm. Check-out time is 10am. Note: Fishing on our property begins after check-in, and continues until check-out time. There is a $50 charge for late checkouts. To hold the cabin for a rental requires a 50% deposit for each night requested. This deposit is fully refundable if canceled 30 days or more prior to arrival. If more than two weeks notice is given, the deposit will be applied to a future trip. If less than two weeks notice is given, the deposit will be forfeited unless the date can be filled. Final Payment & $100 Security Deposit is due at least 30 days prior to scheduled rental date. $100 security deposit required. Fully refundable in the event nothing is damaged or broken, and no excessive cleaning is required. No smoking inside cabins. Sorry, no pets allowed. To: 6053 Zoar Valley rd. "Vince, Hi, we just got back this evening from our family reunion in Gowanda, and I had to sit down right away to let you know what a pleasure it was to stay in the Rainbow Trout cabin at Zoar Valley Escape. My two sons and I had the best time. It was especially nice to have all the accomodations of home close enough to Gowanda without having to impose ourselves on other family or friends or to have to make a trip in and out of Buffalo every day for the expense and inconvenience of a hotel. The cabin is so lovely, and spacious, and comfortable, and well taken care of. It was convenient to where we needed to be and yet "off the beaten path" enough that we felt like we were away from the hustle bustle that tends to detract from a short vacation. Anyway, I could go on and on. Needless to say, we had a very enjoyable time and are already looking forward to returning next year and renting BOTH cabins, so that more of our family members can stay there with us and appreciate the comfort and beauty of your great accommodations. Thank you, again, for renting the cabin out to us."